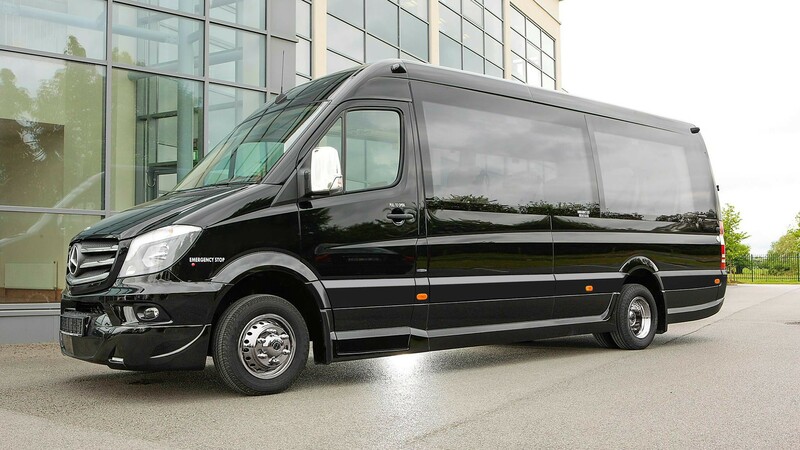 Minibus hire Brno – the largest vehicle available for booking here at Mottify Prague Chauffeurs is our Mercedes Benz Sprinter minibus. We chose this chauffeured mini-coach as part of our fleet because it combines two of our main directives: the comfort and safety of our customers. Our Mercedes Sprinter has the strongest ability to move big groups in style and safety. This mini-coach offers excellent handling compared to similar vans offered by other car makers. For a large group looking for a Brno shuttle bus, consider booking our Sprinter and we assure you an unforgettable luxury travel experience for affordable prices. There are few minibuses from other chauffeur service companies that can compete with the performance of Mottify´s Mercedes Benz Sprinter. Mercedes-Benz has done a fine job balancing utility, comfort, and security with the Sprinter Traveliner, and we’re proud to offer this vehicle option to our customers. Give us a call on +420 602 262 332 or use our Whatsapp for any questions or concerns regarding our services. We are more than happy to assist in any way we can. You can also click this link to book online. All prices for your trip are all-inclusive, including waiting and all special tolls and highway fees for minibuses. Our individual quotes and various options allow you to budget with ease and clarity. Hiring a Minicoach or Minibus with Mottify is easy and straightforward. Located in Prague, Brno and Ostrava, we are perfectly placed for our local and international clients wishing to visit Telc, Tabor, Cesky Krumlov, Krakow, Vienna, Bratislava, Pilsen, Dresden and many more cities. Additionally, we are ready to handle VIP private jet transfers from all major airports within Czechia, Slovakia, Austria and Hungary airports. We have a worldwide client base that travels throughout the UK and Europe. We’ll get you to where you need to be, in discreet luxury. Our chauffeured Jet Sprinter vehicles allow you to enjoy first-class space and comfort akin to a private jet cabin. Whether you require our vehicles for individual tours, airport transfers or social events, you will experience deluxe privacy to your destination.